Mensusa https://www.mensusa.com/articles/tricks-and-tips-on-the-use-of-the-mens-black-suits.html Tricks And Tips On The Use Of The Mens Black Suits The mens black suits project class, elegance and sophistication and it is a coveted line of suiting among the fashionable men. The article will discuss the tricks and tips about the options that you should pick for the different ambiances as well as the ideal choices of the shirts and fashion adornments that should be paired with these suits. Since the conventional days, the mens black suits has stand as a classy and elegant choice of apparel for the fashionable men. Even in contemporary times, you will see that the black suits getting the preferences of men, over the other suits in other shades. The black suits add grace, glamour and class to the appearance of the wearer that enable him to attract the focus and attention of the crowd around him. The article will discuss some tricks and tips to get a more formidable appearance in the black suits. 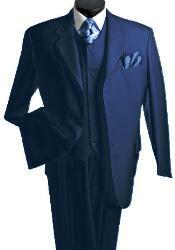 When it comes to the business or formal dressing needs, the mens black suits stand matchless. The portfolio of the black suits includes various options of which the pinstripe and the solid black suits will be the best choices for the formal as well as the business dressing needs. The black suits in pinstripe design, raised in contrast colors will accentuate the grace of the suits and it will attract the attention and focus of the crowd on the wearer. Similarly, the solid black suits will reflect grace and glamour and most importantly will suit and complement the formal and business ambiances. 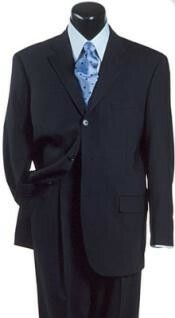 To highlight the black suit, you should pair it with the light shade shirts or the shirts in contrast shades. The choice will depend on the type and spirit of the ambiance that you are attending, the time of the day or evening as well as the suitability of the shade of the shirt on your skin tone. For instance, the pairing between the light shades shirts would be perfect for the formal dressing as well as for the daytime appearances. The shirts in contrast shades will be perfect for the promenade occasions and the evening events. 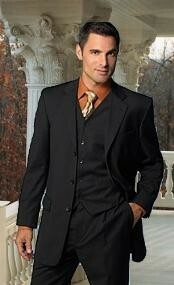 You should pair the black suits with the fashion adornments in the shades like black, chestnut, brown and chocolate. The shades would complement the black suits and highlight its grace. Hence, the combination will uphold your superlative fashion pursuits as well your mature and classy sense of dressing. Thus, the focus and attention of the people around you will automatically get attracted towards you and hence, it will be easier for you to impress them with your appearance. www.mensusa.com is the one-stop source to get the best apparels and fashion adornments from the top fashion brands at the cheapest rates. The store had won over the reliance and trust of the buyers, offering quality products and backing it with exceptional customer services.